Enjoying the lunch that the guest cooked. In various destinations around South East Asia especially in Thailand where attending a cooking class during your holiday to the country has become a norm. In Malaysia, there are some such cooking tours in Kuala Lumpur and the most popular one is in Langkawi. 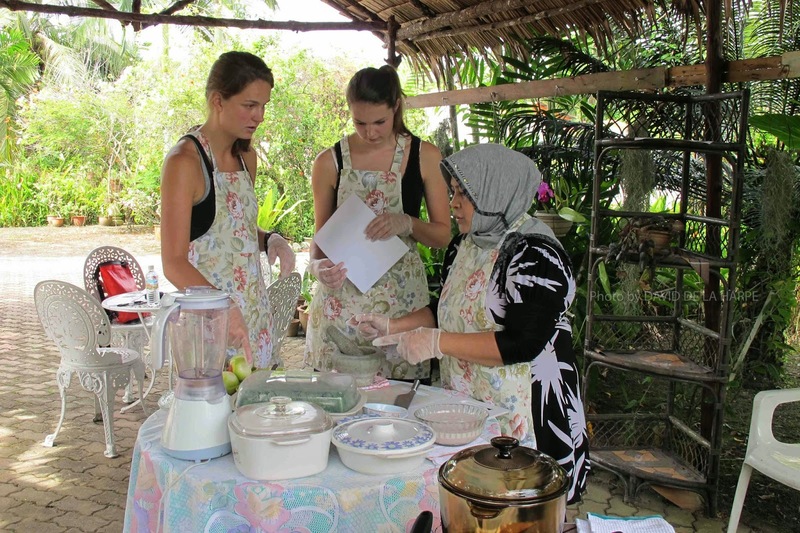 With the growing number of tourists visiting Sabah, there have been numerous requests for such cooking classes. Hajah Halimah, who owns a travel agency, has decided to pass on her culinary skills to visitors to Sabah. Learning about the various food by Hajah. Hajah Halimah is a mother of three children and lives in the coastal town of Kinarut. The inhabitants here are predominantly of Bajau and Brunei Malay descent and their cuisine features a lot of seafood and poultry that is cooked with a wide selection of locally grown herbs and spices. Like many of the people in Sabah, Hajah herself is a mixture of Bajau, Dusun and Brunei Malay. Having a passion for cooking, she learned about the traditional recipes from her mother and other family relatives during her early childhood. 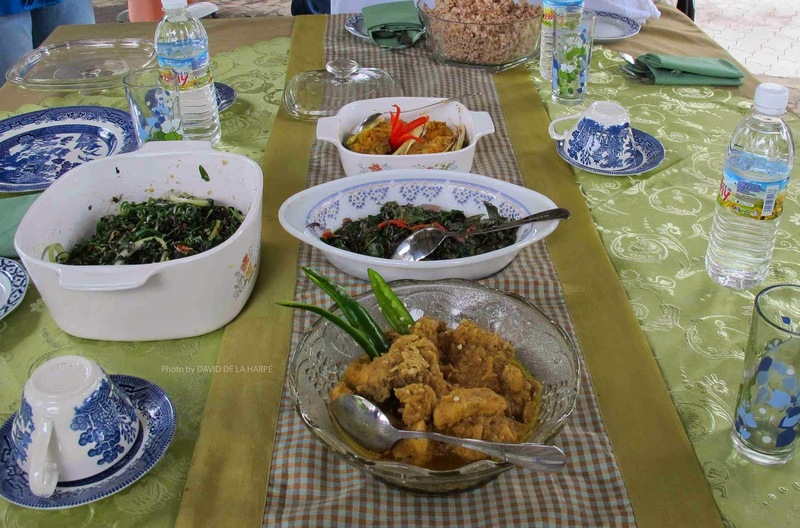 She has also added many recipes from various ethnic groups found in Sabah. Some od the dishes cooked by the guest. In the old days, the chopping and pounding of the fresh herbs and spices were all done by hand in a stone mortar and was a skill that one usually learned when young, from your elders. There is an order as to which spices go into the stone mortar first. It is usually the soaked dry chillies or fresh chillies. When this has been ground to a fine paste, the harder herbs like ginger and turmeric root are added, followed by garlic and onions. Many a young cook has been brought to tears by the spicy juice from chillies while learning the technique of grinding wet spices. Dry spice on the other hand are first gently heated in a dry pan to bring out the aromatic flavour before being ground and added to the dish. Learning about the various erbs and spices. 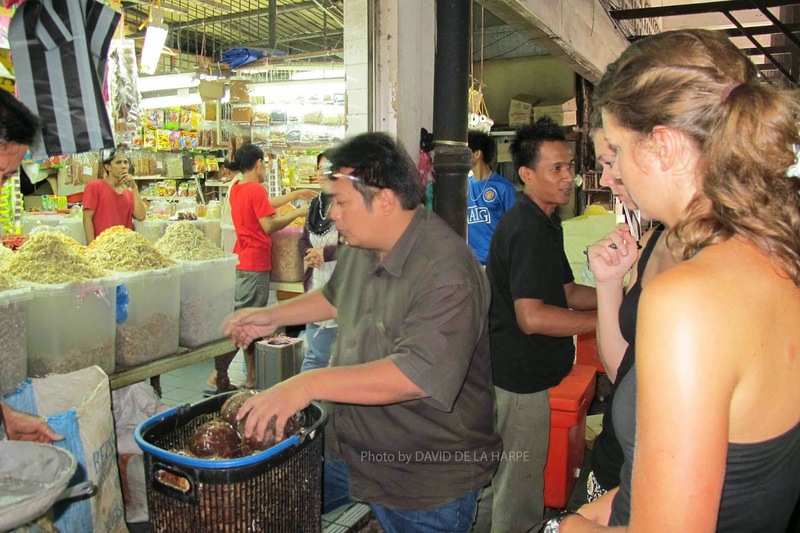 In this particular tour that Hajah conducts, her clients are picked up from their respective hotels in the city and taken to the Kota Kinabalu central market. As part of the interactive tour, they are given a list of ingredients to purchase together with the assistance of their tour guide. At the market, they are introduced to the various fresh herbs such as lemon grass, gingers like turmeric, galangal and torch ginger flowers, Thai basil, petai beans, belacan (Fermented shrimp paste) and the various local fruits and vegetables. They also learn about the various dry spices on sale in the Spice section of the market and the use of coconut. At the local cake section, guest get to sample the many varieties of colourful local cakes sold here and if the guests are interested, a walk around the fish market is also included. Having finished their purchases, the guests are driven to Hajah Halima’s house in Kinarut, which is about 30 minutes away from the city. The house has a lovely garden full of tropical flowers, fruits and a number of local herbs, which are used in our local cuisine. Upon arrival at the home of Hajah Halima, guests are greeted by Hajah, who hands out copies of the recipes to be cooked that day. She then runs through the ingredients and procedures required. As this is a hands on workshop, guest are provided with aprons and then given little task to do from grinding the wet herbs and spices in a mortar to cleaning and cutting up vegetables. Today’s dishes will be “ayam likku” or chicken in fresh herbs & spices which is typical chicken dish of the Bugis people and “kerabu pakis” a vegetable dish of Jungle ferns cooked with dried shrimp , chillies and roasted coconut. The guests then get busy preparing, cutting and grinding the various ingredients under the watchful eyes of Hajah, followed by cooking the dishes themselves. When everything is done, everybody sits down to have a sumptuous meal of local food, which they have helped, prepared and cooked. Local cakes are served with choices of Tenom coffee or Sabah tea to polish off the meal. The guest have learned some new recipes, had an opportunity to meet local people and learn about the culture, while making some new friends. It is an experience that will be remembered for many years to come.